Well, we got here with remarkably little disturbance from storms or hurricanes and spent the first day mostly just chilling out. Got up early (it's the time difference - always gets me) and mooched around the fleamarkets for a few hours, came back and swam in the pool for a bit then went out to The Wharf and ate lots of lovely seafood. That morning there were dolphins swimming just off the beach. Yesterday we felt all rested, so after a hearty breakfast at Beverly's we went to Sarasota on a book hunt. Unfortunately we were disappointed in our first destination. The totally wonderful Main Books is no more it seems. Apparently they had a sprinkler accident and then a fire - neither of these are things that you want in a bookshop. I was especially sad as if I was ever to own a second-hand bookshop I'd want it to be like Main Books - four floors covering every subject you could think of and a few you'd never have thought of in a million years. Polished wooden floors, friendly staff and a cat that slept on the counter. Great atmosphere - I'm sorry it's gone. A quick trip to Helen's comics just down the road lead to a copy of Feathered Star Quilts. We pressed on, visiting Alma Mae's Quilt Shop, which was lovely, with lovely fabrics, but I didn't buy anything, via a few paperback exchanges and a Borders, where I scored a hardback copy of Laurie R King's The Art of Detection from the bargain table (cheaper than the paperback! ), to Brant's Books. Brant's is housed in an old army barracks and is possibly the most dilapidated bookstore you ever saw in your life. The floor sags and moans when you walk on it, making browsing an interesting experience. They were having a closing down sale though - and don't seem to have any new premises as yet. I hope they find them soon - bookstores like this are getting fewer and fewer as rent increases and redevelopments force them out. Brant's win my store of the day award though for having the book I had been searching for it in all the bookstores and fleamarket bookstalls I've been in since I got here - trust me , there have been a few. Cypress Grove by James Sallis. This is the first in a trilogy, the last part being published later this year in the UK I think. There was a review in the Bookseller and I thought it looked interesting. Apparently he's a bit like James Lee Burke - lyrical and clever. We shall see. I had thought he would be easy to find here but it seems not. The bloke in Borders told me there was no such writer! Anyway I was lucky enough to find a copy at Brant's and for a very reasonable price (even in the sale). Then we hit a very good branch of Barnes and Noble where I didn't buy anything but was sorely tempted by their vast range of crafty books. 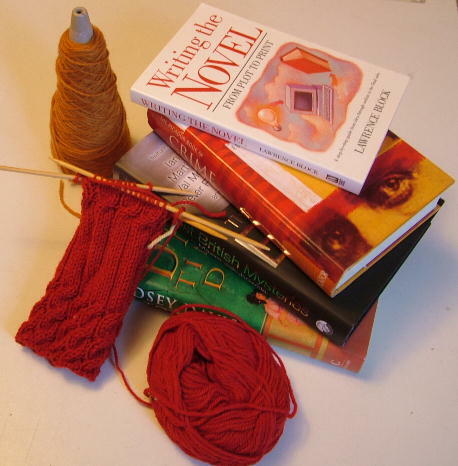 No time to waste, we sallied on to Books a Million which was great - I got a copy of The Beekeeper's Apprentice (sadly out of print in the UK and I'd never read it), the Yarn Harlot's 2009 page a day calender and Knitting Vintage Socks by Nancy Bush. Lastly, and I was beginning to flag by this point, I visited The Spinning Wheel, good local yarn store of Sarasota. They had the Norah Gaughan Vol 3 book, but sadly not the first two volumes. I was a bit overwhelmed by the multitude of strange and new yarns and didn't buy any. Still, there are several other yarn stores on my list - still plenty of chances to buy some yarn. A very good day indeed, rounded off with dinner at PJ's Seafood Restaurant, just around the corner from the apartment. Heaven. Sounds like a great day!! Have you visited Haslam's book store in St. Pete. Haslam's Book Store, Inc. It's a used and new book store and its' one of my favorites. You should check it out.